Among a few of the guaranteed things that can keep you up at night wondering is the question of whether or not the woman you have your eye on is interested in you. You’ll probably be questioning whether or not she likes you or what that text meant and while there’s no set in stone way to figure it out, there are a few solid clues that might get you a bit closer to figuring out of she is interested in you. The world over, women use their eyes to do most of the talking. Lingering eye contact lasting for several seconds or the ‘eye flick’, a glance that catches your eye, holds, breaks eye contact and then comes back a few seconds later, are both ways that women try to show you their interest. Didn’t catch it the first time? Don’t worry, this signal is often repeated several times. In our mobile world, we often have to decipher vague texts to see if they may mean something more. While this is a tricky one, since it could simply be friendly, a good sign that a girl may be interested in flirting with you is if she sends you funny texts out of the blue with no context. This is especially true if you don’t text regularly. If you notice that when you’re chatting with her, she sips her water when you do and touch her face when you do, she may be interested in you. Mirroring is a way to put people at ease, since someone who behaves the way you do will put you at ease. When a woman tells you stories about herself that put her in a vulnerable or embarrassing position, she’s trying to open up to you and let you in. While men will often self-aggrandize, women prefer to show vulnerability to show their willingness to let someone get close to them. It may seem childish, but blushing is a natural physiological reaction that is involuntarily. If she blushes around you a lot it may be a response to her nervousness due to her attraction to you. This does not apply if she’s excessively shy and blushes all the time. If you approach her at her desk and she turns her entire body towards you, it’s a good sign. Blocking the body with a purse or piece of furniture doesn’t mean she’s afraid of you, but it may mean she’s not that attracted to you. People who are attracted open up the entire front of their body to their potential partner. Both men and women do this, but when a woman is around a man she’s interested in, her vocal register will go down. She will do this automatically without noticing it, which may be because of her elevated heart rate and shallower breathing, but the vocal register will be the easiest to notice. If you’re chatting with an acquaintance or a co-worker and you notice that she’s continually finding new topics or things to bring up with you, she may be attracted to you. 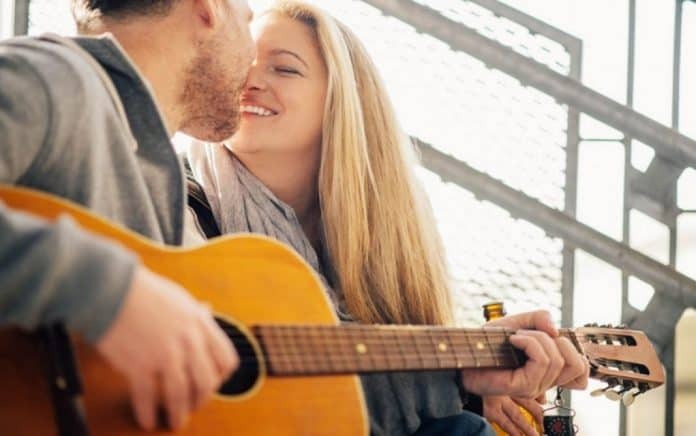 It may seem too simplistic, but if she likes to talk to you and continues conversations even when you give her a chance to end them, she may be into you. Light, seemingly friendly touches for no reason are a good sign that a woman is interested in you. If you’re talking and she taps you on the back of the hand or places her hand on your shoulder after laughing at a joke, she’s trying to initiate contact. This doesn’t apply if she’s tapping your shoulder uncomfortably to get your attention when you have headphones in. ‘Hey stranger’ might be the oldest flirty line there is, but other ways a woman may show that she wants you to get closer to her are to mention that she’s missed seeing you or that you’ve barely spoken recently, or if she flat out says that you’re being a stranger with her.